This is a small demo that I've been showing on Twitter/Tumblr yesterday. 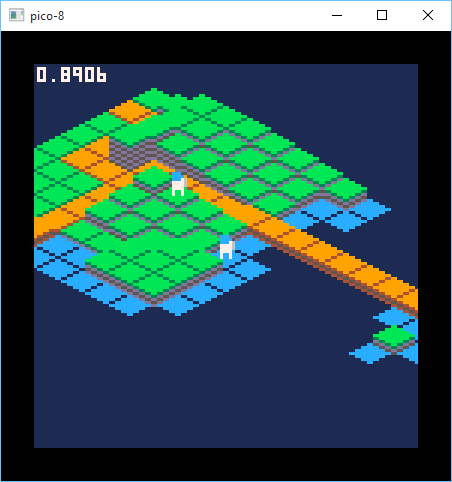 Currently there isn't much going on other than concept demonstration (and most of "engine" code needed). The code is laid out to allow taking it in various directions from here. looks great! are you limited to the 7x7 or can you render out to the edges? 7x7 "viewport" is largely a stylistic choice (and a bit of a reference to the "Rings of Power" game for Sega Genesis). Awesome! I was thinking about doing something with isometric coordinates next. The small viewport reminds me a little of Populous, too. Really great. I think I said in IRC, I like the idea of doing a tiny riff on X-Com, and this is inspiring on that front. To me it was screaming Spindizzy, actually. Awesome work! I have been making isometric game design art that this game reminds me of. I want to use this mechanic for my own game on unity, but wanted to make sure that that was ok with you. It's an isometric explorer who may or may not wear a spacesuit at one point. I'm sure that other people have made similar games but I saw your's first. I don't want any trouble so I'm checking if it's ok with you first.